OK, so the actual talk about Doujin games happens a fair bit down this post; I had lots of lead-up. Sorry about that. So, back in August, I switched over to a new computer – a shiny new 13″ Macbook Pro – went on vacation, finally broke a six-week long moratorium on game buying, and started some new projects. Hence, a 3 week gap between substantial posts here, not that anyone other than my regular readers – both of them – will have noticed. Getting used to a laptop as my main PC hasn’t been that bad. It’s a move that my wife made about a year ago, but I’ve been a bit hesitant – to be blunt, I like tinkering with the guts of my PC, and that’s something you really can’t do on a laptop. I replaced the pitiful 160GB drive Apple puts in their laptops with a 500GB drive the same night I got it home, but that – and, I suppose, a RAM upgrade – is about all you can do with one of these. Still, since my ultimate goal here is to be able to fit into a smaller space, laptop it is. I’ll just have to deal with letting my Newegg account go fallow. In the last few weeks, I’ve gone through a bunch of games. Unfortunately I also bought, like, seven new ones when I broke my moratorium, but what the hell. When we went on vacation, I took The World Ends With You along. I’ve heard it described as a JRPG for people who don’t like JRPGs, and I think that’s a fair description. In my case, it’s a JRPG for people who actually DO like JRPGs but who also don’t have 80 hours to spend playing through one. I really can’t praise it highly enough. It throws a lot of fairly complex mechanics at the player, but it’s kind enough to let most of them be optional; you CAN spend hours on picky character customization and getting used to the game’s weird two-characters-at-once combat system, or you can ignore most of the customization and let the AI handle your support character. I went with that path, and was happier for it. Yeah, the story veers a little into the hopelessly emo now and again, but I never found myself groaning too hard; it had some good twists and shocks in it and I enjoyed the whole thing. The soundtrack is also highly recommended; I felt compelled to drop 10 bucks on iTunes to score myself a copy and I’ve been listening to it a lot over the last couple of days. After finishing that, I tackled Plants Vs Zombies, feeling a little dirty in the process. After all, what sort of Real Gamer plays PopCap titles? Then I remembered that I’m actually pretty lousy and pretty far from being a Real Gamer, so I got down to the, uh, planting. Playing through the main game took two fairly long sittings, and the only reason I broke it into two was because it was starting to cause me physical pain. I think the last big click fest I played was The Witcher, but there were enough breaks in the action that I was able to recover. PvZ is pretty much non-stop. I don’t have much to say about the game that hasn’t been said before; it’s really fun and straddles the border of casual fare and more serious stuff neatly. It was also the first attempt at gaming on the Macbook. I felt a little silly booting into Windows to play it, since it’s also available for the Mac, but it’s $20 for the Mac version at retail or from PopCap’s site and $10 for the PC version off Steam. Basic economics won out. Since I’d already loaded boot camp and installed one game, I decided to go all out with the huge stash of doujin games I brought back from Japan in 2007. They’re usually pretty cheap. I think most of them were between Y500 and Y2000. The system requirements tend to be extremely reasonable. Most of them could be played on a 10 year old machine. Most of them have a limited number of continues and lives, etc, so you can’t see the end on the first play-through. This is both a plus and a minus; some of them are way too hard for me, and I have to face that I’ll never beat them, but it improves the ones that hit my sweet spot for difficulty level. There’s a tremendous motivation to try “just one more game” that really tickles the old pleasure center. The bullet-hell-style shooter is well represented, and while I AM crap at bullet hell shooters, I love playing them. They frequently parody other games & anime, so they can be funny as all get out. Oh, and there’s an awful lot of naughty mahjong games, which, again, I’m a big fan of the jubblies genre. Honestly, the only one so far that’s hit the last category was a dodgeball game that had Kanon and Air characters. It was cute and all that, but it was, well, a dodgeball game and one that I didn’t really understand how to play. 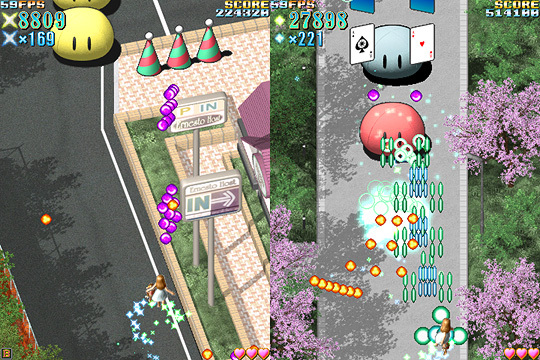 The Big Name Developer in the doujin bullet hell shooter genre is Team Shanghai Alice, or Zun, or Touhou or, well, I’ve never been straight on how exactly to refer to the guy – he’s a one man developer / art / music team who’s amazingly popular and so on and so forth. His games are, well, they’re pretty hard. He’s fond of painting most of the screen with fairly slow-moving projectiles and it gets quite tough to dodge them. Now, obviously, when I say “played through”, I don’t mean played through in the sense of actually being any good; more in the sense of jamming the bomb button whenever it looked like I’d get hit and using continues. They’re pretty cool games, but they would require actual commitment to get any good at and I wasn’t drawn in enough to decide to put in the time. I had rather a better time with Gensou Shoujo, a Clannad-themed bullet-hell cute-em-up from tenkuu dokei. 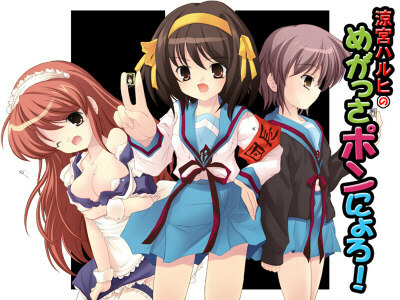 I also played through a Haruhi-themed mahjong game from LooseWords. Yes, it’s as naughty as it looks. That was about the most work-safe picture I could steal from their pages. It’s very much simplified mahjong. You have a nine tile hand instead of 14 and there’s no concept of “chi” or any advanced hands; your only goal is to collect three “pons”, with an ultimate goal of running one of your three opponents out of points, at which point they have to ditch a bit of school uniform and the process starts all over again. Since everyone starts with a good sized bankroll and it’s a four-player game, this can take some while. It was pretty fun. It doesn’t feel like the developers spent much time on the AI, which is probably why it’s such a simplified version of mahjong, but there’s a lot of conversation between the characters and the art is good. The game ends when any one of your opponents runs completely out of school uniform, so in theory it would take three passes to play through – I played through it once and called it beaten; I may go back to it at some point. Those four were the ones that didn’t immediately crush my spirit; I tried a bunch of others but honestly this post is rambling on long enough. This entry was posted in nds, PC Gaming, videogames. Bookmark the permalink.